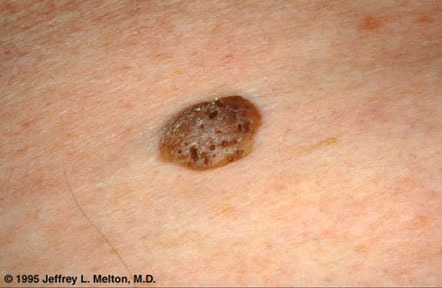 This seborrheic keratosis is darker colored. Seborrheic keratoses are very common lesions which tend to appear after age 30 and are increasingly common in older age groups. The temples, the rest of the face, and the back are common locations. Medically, seborrheic keratoses are usually insignificant, but can be treated (see treated image) if repeatedly irritated, or for cosmetic reasons. Seborrheic keratoses are not thought to be related to either seborrheic dermatitis or actinic keratoses.